On the heels of today's Creative Cloud software announcement, Adobe pulled the wraps off a new peripheral initiative for creating on a slate. 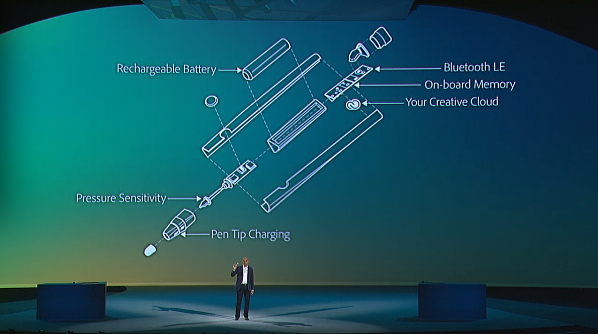 First, Project Mighty is a cloud-connected stylus experiment that pulls tools from Creative Cloud setups and offers pressure sensitivity, a rechargeable battery, Bluetooth connectivity and built-in memory. This device is part of a new undertaking for Adobe that will seek to bridge the gap between software and hardware. In addition to Mighty, there's Project Napoleon, which will offer a second tool for tablet-style drawing. This peripheral will project straight lines to keep sketches neat and tidy in a high-tech ruler fashion. Details are scarce on both items for now, but those who are interested can opt for updates via the source link.